In the IARU HF 2011 I worked 36 DXCC counties. If I compare this overview of the IARU HF contest with similar overviews from 9 years ago, when the the number of sun spots was higher, the difference is that the UA stations that are worked with 8 to 80 mW now, in 2003 could be worked with 5 mW to 50 mW. This influence of declining sun spots over the years is far less than the daily fluctuation. It is great to participate in a contest with "World Wide" activity. This activity is almost as important as the propagation. I met stations with Excellent Ears and many stations with very good operators. As you can see, I had great fun with low power. Thanks to all these fine operators. I live near the radio ad TV tower in Lopik, near the city of IJsselstein in the centre of the Netherlands. This tower can be seen on my QSL card. After a fire today in the tower, the radio and TV transmitters were shut down. The TV tower was built in the 60's. Aad PA0YA (SK) worked in the tower and tolt my how the tower was built. As you can see in the Blog of Paul PC4T there was also a fire in the tower of Hoogersmilde, which was built to cover the northern part of the Netherlands. This fire was much more dramatic, because it made the tower to collaps. This means that the northern part of the Netherlands is trown back in to the 50's with no TV and FM radio. Aad PA0YA (SK) tolt me a story about the tower in Hoogersmilde. Many years ago, a fighter jet almost hit the tower. At the last moment before the collision, the pilot turn the plane, but cutted one of the guy wires, with one of the wings. Luckely the tower did not collapes (then) and the plane landed savely at the base. I did not use a fixed power, in the IARU HF World Championship, but I used the Lowest Possible Power in nearly every QSO. After a destructive mismatch, a few months ago, the power of my FT-817 is reduced. So now the power can be adjusted to: 360 mW, 800 mW, 1.8 W or 2.7 W. The antenna is an Inverted Vee. But notice that even with a power of 2.7 W, every QSO with Canada or the USA is good for more than 1000 Miles per Watt. The stronger the received signal, the lower the power that I use. When a station can hear me, but can not copy, I immediately double my power which is a step of 3 dB. For a power lower than 360 mW, I use homebrew attenuators. Click for info on attenuators. Because I use the Lowest Possible Power in ech QSO, I search and pounce. It's hard work, in which you need perseverence and patience. I worked YR1C with 36 mW on 14 MHz. His signal was very strong, still S+ through the 10 dB attenuator. After first working 5 other stations, he heard my call and immediately responded with my call (not correct) and my report. I corrected my call and gave my report. Now the frequecy was clear, so he received my signal with a good readability and the QSO could be completed easily. An other station with a very strong signal was R3HQ, which I received with S+ + 20 dB. I first tried 8 mW, but I worked him with 18 mW. The lowest power I used in this contest, was in a QSO with RU1A. I received his signal with S++ through the attenuator of 20 dB. I met the team of RU1A before with exteme low power. I knew that this station has Excellent Ears. So I went for the really lowest power. I started with 3.6 mW. They were very busy answering other stations which I could hear, but also that I could not hear. In the proces of answering the CQ's, I already increased to 8 mW and to 18 mW, after question marks, that were not for me. Then after 10 or more calls, I realised, that the signal that I received, was so ear shattering strong, that 3.6 mW could work. So I went back to 3.6 mW. By the 15th time I called, my signal was heard, but not copied, so I increased to 8 mW and made the QSO. which I worked with only 360 mW. Outstanding! Working with low power is not so difficult. YU8HQ was S+ on 10 meters, so all I did was reduce to 360 mW. S50HQ had so many callers, that he could not hear me with 800 mW. When I came back later, the frequency was clear and the QSO was made with 360 mW. Both QSO's are good for more than 1000 MPW. In the contest 125 QSO's on 5 bands are made. In this survey you can see the power that was used for each QSO, for each band. Please notice that on 40 m 81% of the QSO's were made with 800 mW or less. On 20 m 54% of the QSO's. The distrubution the number of QSO's over the power catagories is entirely determined by the propagation. 71 out of 125 QSO's (57%) are more than 1000 Miles per Watt QSO's. Even with 2.7 W it's possible to break through the 1000 MPW boundary. The most spectaculair results are found on the 20 m band. * In every contest it's still possible to work with low power and make more than 1000 Miles per watt QSO's. As a milliwatt enthusiast, I often make QSO's with the lowest possible power. 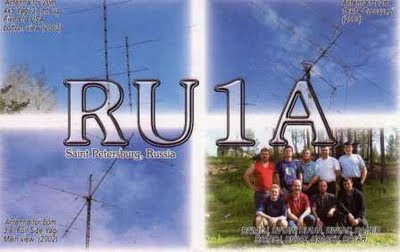 In the IARU HF World Championship 2011 I met RU1A. Their signal was S+++20 dB. Thus S++ through a 20 dB attenuator. When I was answering for the 10th time or more, and my signal was still not heard, I wanted to increase my power. But then I realized (again) that the signal was very, very strong. So I kept answering with 3.6 mW and my perseverance payed off. He did hear my with 3.6 mW, but he did not copy my call, so I immediately went to 8 mW. Then my call was copied immediately and the QSO was made. Большое спасибо to the fine operators with their Excellent Ears at RU1A. This is the card that I received for a QSO with just 1 mW in 2004 . Sun spots or no sun spots, it is still possible to make QSO's with very low power. Gisteren zijn we naar het Safaripark Beekse Bergen geweest. We zijn met de bus tussen de wilde dieren doorgereden, terwijl de Ranger vertelde en regelmatig stopte om de dieren goed te bekijken. Op "wandel safari" zijn we verder het park rond gelopen. We hadden prachtig weer. I participated in the 30th OQRP contest in the VLP category (less than 1 watt) and had fun with my homebrew 7 MHz CW transceiver. The TRX is the HM7, that I built many years ago. Click on the HM7. This rig comes from "Solid State Design for the radio amateur" page 214...218. My homebrew transceiver has no automatic gain control (AGC), which is a real pain in the ears, when the received signal is strong, such as RST 599 or even more. In this contest I experienced again, that in a receiver with manual gain control, strong signals are very strong in the headphones. With this receiver you are always too late with strong signals. The report in the OQRP contest is RST, serial-no./ category e.g. 559001/VLP. This makes more fun than the usual reports with 599. You must be very keen on the received RST. All QRP stations that I met, gave a RST lower than 599. The QRO station gave 599. The signal reports from 519 to 589 are a real RST. Somtimes the other station was much weaker than QRM from other stations, but still the exchange was easily copied. I made only 14 QSO's. My DXCC score: DL (11), OK (1), S5 (1) and SM (1). On sunday we went to "Fort bij Vechten" to visit the fort, during the open day.